The players vary, but who is really controlling occupancy of the host mucosal surfaces? The host may no longer be the sole ruling factor controlling the receptor sites for attachment of microbes, and thus membership in the host microbiome. A fundamental paradigm has been that the host provided mucosal surfaces for the resident flora (microbiome). Under normal circumstances, these polymicrobial tenants are good neighbors by taking up available receptor sites that pathogens could utilize and eliciting a cross-protective immune response that provides natural immunity. They also pay their rent by providing the host with essential vitamins and other nutrients. In either case the host regulates the membership of the microbiome and the neighborhoods (geographic sites) that they may colonize. This paradigm that the host is the sole arbiter of microbiome residency may no longer hold. The study by Plotkin and Sigar, et al., shows that herpes simplex virus (HSV-1 and HSV-2) can, in part, control membership of the microbiome. HSV-1 and HSV-2 have been unwanted tenants in humans for about 1.6 million years. Most of the time, the approximately two-thirds of the population infected are unaware that HSV-1 and/or HSV-2 are present until a cold sore or a genital ulcer erupts. In multiple studies mapping the locations where various members of the microbiome and pathogens reside, it has been a curious anomaly that while herpes has permanent residence in the mouth, along with the sometime presence of the opportunistic fungal pathogen Candida albicans, Staphylococcus aureus is really only found in the nose (anterior nasal nares). This geographic specificity in the host is even more curious when in vitro studies show that all three organisms have the ability in vitro to attach to cells taken from the mouth, i.e., buccal epithelial cells. 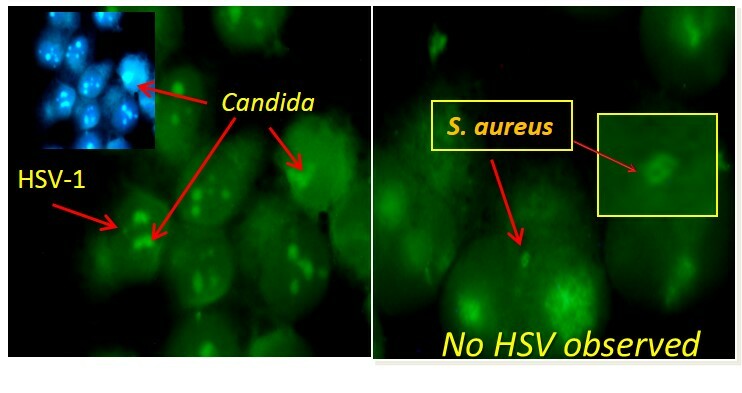 This curious specificity in localization of colonization may be explained, in part, by the findings that cells infected with either HSV-1 or HSV-2 differentially allow adherence of S. aureus and C. albicans to their surface. On one hand the presence of herpes virus in cells enhances the ability of C. albicans to adhere to the virus-infected cell. However, HSV-1 and HSV-2 are particular about who should share their home, the cell. So, depending on whether HSV-1 or HSV-2 are present controls whether the yeast form of the Candida attaches to the cell, or if it’s the more pathogenic germ tube form of C. albicans. HSV-1, which is mostly found in the mouth, is more inviting to the candidal yeast form; enhancing its attachment to virally infected cells as compared to uninfected cells. In contrast HSV-2, which mostly causes ulcers in the urogenital tract, enhances adherence of the candidal germ tube form. In contrast, the presence of HSV-1 or HSV-2 inhibits the adherence of S. aureus to the cell. Thus, microbe geographic site of colonization may be virally regulated. In this case, it appears that our permanent tenant, HSV, invites other organisms, e.g. C. albicans, to couch surf on cells that it has infected, and stops unwanted visitors (S. aureus) from crossing the HSV-infected cell threshold, or from even moving into the neighborhood. Herpes Simplex Virus (HSV) Modulation of Staphylococcus aureus and Candida albicans Initiation of HeLa 299 Cell-Associated Biofilm.